I don’t have any income from my writing yet. Do I still file a tax return for it? Yes, a writer with a profit motive can and should file a Schedule C Profit or Loss from Business with their personal Form 1040 and claim their legitimate business expenses. My business is related to the book I’m writing. Can I combine the two on my tax return or are they separate businesses? 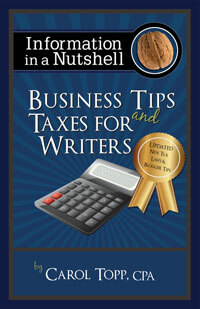 You can combine the business and writing because they are closely related. Is it to my advantage to just call myself a hobby writer and avoid paying tax? Calling your writing a hobby — when you have been paid — can be detrimental to your pocketbook. In other words, you may be paying too much in income tax because, unlike a business, many expenses for hobbyists are not tax-deductible. It’s fairly easy to convert a hobby into a business. You simply have a profit motive and conduct your writing as a business — meaning you keep records, consult a professional when needed, and improve your knowledge in the area of writing, as a business owner would do. Seek out an accountant who has the ability teach you the financial side of your business. You should feel comfortable with him or her and feel free to ask questions. If you leave a meeting with an accountant feeling confused, you need to find another accountant. To find a helpful professional, ask other small business owners in your area for their accountant’s contact information or call your state CPA society. Find a listing at www.taxsites.com/cpa-societies.html. Or use Quickbooks ProAdvisor program to find a local tax professional. Some of these Quickbooks experts are CPAs, some are not.